It’s always great to see a game on Kickstarter gets fully backed. Usually, the games are pitched very well, and most of the time, have very cool concepts rope backers in. Songbringer is an example of that. The game was backed in 2015 by the developer, Wizard Fu, which is really just one dude named Nathanael Weiss. Due to the stretch goals it has received, the game has been in development more than a year in order for it to launch for the PS4 and Xbox One, and it recently released this summer to both consoles and Steam for PCs. 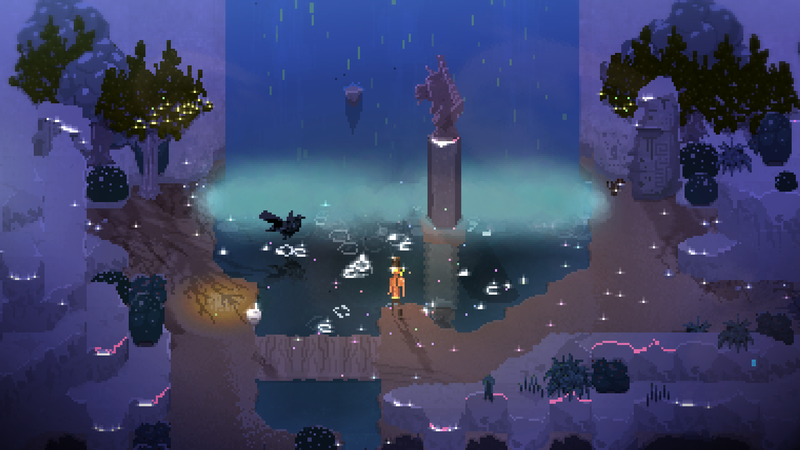 Songbringer claims to be inspired by the Zelda games and procedural generation. If you don’t know anything about procedural generation, it’s just a way for games to generate content in a somewhat random manner. For Songbringer, the procedural generation is done is by way of a six-letter word that you input at the beginning of the game. That word then generates a world filled with enemies and dungeons. It’s almost like a new experience every time…if you pick a different word every new game. The best part about the six-letter-word seed system is that the generated world for a certain word (try “Wizard”) will always generate that same world. Thus, it creates that perfect balance of consistency and randomness. Generating the same world is perfect for those who want to complete a speedrun of the game (which unlocks an trophy/achievement), since it will allow you to learn that certain world’s intricacies. You can also opt for a complete rogue-like experience of Songbringer by coupling a different seed word with the permadeath option (i.e., when you die, you don’t get a do-over). 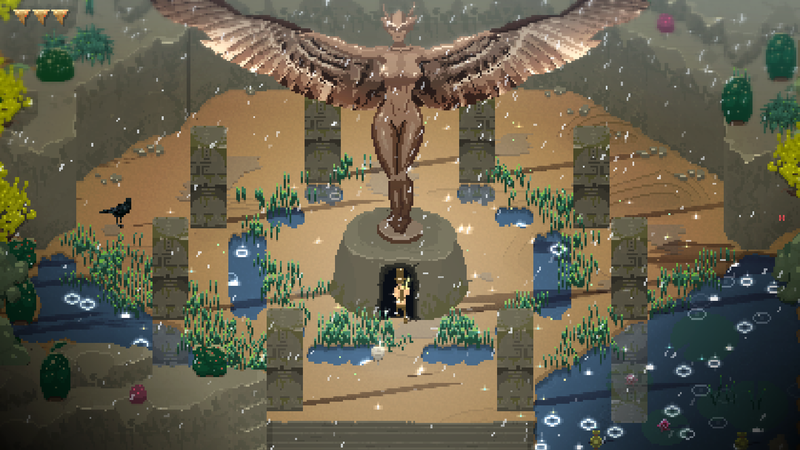 Interestingly, the story of Songbringer is very reminiscent to Zelda games. You take on the role of Roq, a hedonistic spaceman whose ship crashes to the world of Ekzerra. His crash site is near a cave, which contains a humming sword that ropes him in. As Roq picks up the sword, he begins his journey in unraveling some of the dark secrets Ekzerra holds. Those secrets are held in the dungeons Roq will go through in order to fix his ship. Roq is accompanied by a skybot named Jib. One of the games cool gameplay aspect is having Jib as a support character. Jib can hover over dispatched enemies to search for loot, and after some upgrades, Jib can attack some of the enemies too. Songbringer actually allows a local multiplayer option for a friend (or stranger) to join in on the fun and control Jib. Unfortunately, the disappointing this is also controlling Jib; it’s not as fun as controlling another Roq, since Roq is given more actions and weapons to play with. Another interesting aspect of Songbringer are the items Roq acquires throughout his journey. Besides the nanosword (what the humming sword in the cave is called), Roq gains weapons that are also similar to Zelda games such as a top hat that works like a boomerang and matter bombs that can destroy cracked walls. One awesome gameplay aspect is that Roq can visit the Droidsmith and combine his weapons and items. By combining, you are able to enhance items such as a teleportation orb to freeze or set enemies ablaze. The item combination is definitely key to making Roq’s journey easy in Songbringer. Slinging a top hat that freezes enemies that bob up and down the water definitely makes them easier to attack. One annoyance that I’ve seen happen a few times though is that the enemies get pushed to a spot where it is covered by a tree or a rock, and it gets hard to figure out where they are hiding. It’s especially problematic for enemies that hit Roq by touch. 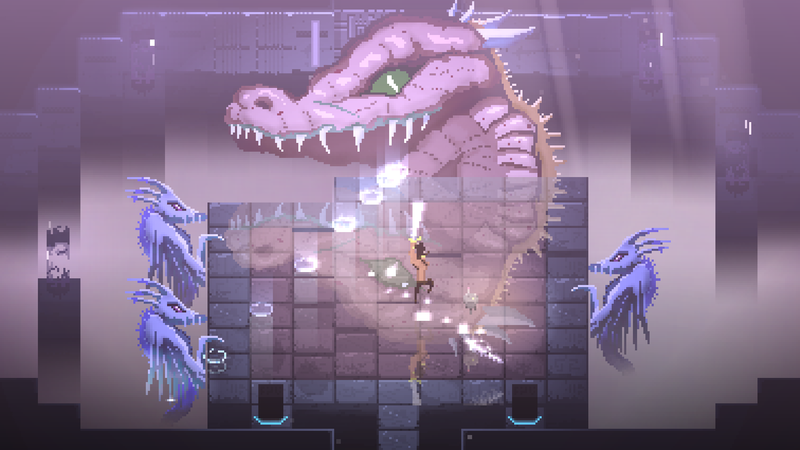 However, that’s easy to overlook with Songbringer having some great gameplay elements up its sleeve. Taking some great references from Zelda games has really paid off. In addition, elevating the game to modern standards with the option of playing it as a rogue-like and combining weapons and items gives the game extra points. If you are looking for a good adventure game, then you should think about picking up Songbringer.